Bring your prototypes to life by adding gestures and transitions easily with hotspots! 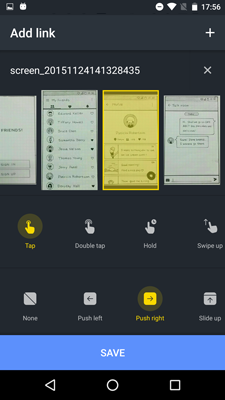 Gestures are the actions that prompt the transition to another screen. For example, tap, double tap, swipe left, swipe right to name a few. Transitions are the motion or animation you see, prompted by a gesture, to move to the target screen. For example, slide left, slide right, slide down, slide up to name a few. 1. To assign a gesture or a transition, tap on any hotspot, then tap the squiggly line icon to go to the link options. 2. Select the gesture and transition of your choice, then tap "Save". Instantly test out your gestures and transitions in the preview mode by tapping the play button.